One of the first to get inside of one of the most memorable Royal Castles of Europe. 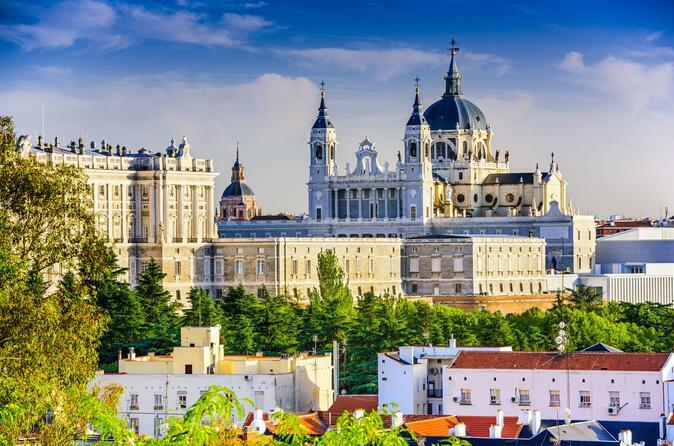 on this tour with an early access, you’ll get to avoid the crowds and meet the famous Royal Palace of Madrid.You will visit areas of the Royal Palace of Madrid that other visitors don’t get to see .The Royal Palace of Madrid was the official residence of the Spanish Royal Family. Nowadays, it’s used exclusively for receptions, ceremonies and official events. The Royal Palace is also called Palacio de Oriente. For interior decoration, rich materials were used: Spanish marble, stucco, mahogany doors and windows and important works of art, particularly frescoes by leading artists of the moment as Giaquinto, Tiepolo and Mengs and his Spanish followers Bayeu and Maella. This visit includes a tour around stances such as: Official Lounges: Grandiose, well preserved and stylish, each room has its own personality. The Throne Room will astonish you. Royal Armouries: Take a look at one of the most important displays of armors, shields and weapons in the world.Royal Pharmacy: Hundreds of bottles of different shapes and sizes that will make you feel inside the ancient times. During the tour we’ll also visit the gardens of Campo del Moro, where we’ll find a fabulous garden in he style of the English nineteenth century, following the Romantic concept of nature, used to create one of the best perspectives of Madrid, behind a large green carpet dotted with monumental fountains within a broad and gloomy romantic garden. The gardens have two neo-classical Fountains “The Tritons” and the “Palacio de las Conchas”.